Start the programme; clicking on Plug-in/CCD Camera will screen the CCD Camera – Control Panel. 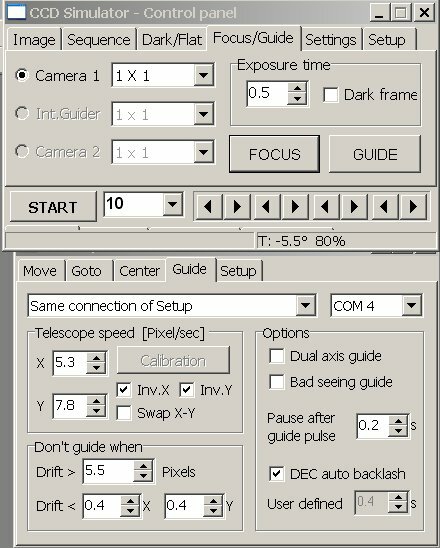 Check your camera in the CCD Camera drop down list, then click Check CCD, and another panel opens. Check the details of your camera there and click OK. If it is OK, there will be silence, if the programme complains, make adjustments to suit it. When allowed to enter, click Image and uncheck New window, then Start, and a 3 sec frame will be taken. It will be screened and probably blank, but full of noise. However, you now know all is set for work. Move the Control panel to a corner of the screen to be out of the way. Send the telescope to a brightish star, as close as reasonable to your intended target, or your focussing will be of no value, and take another frame. If you have the star in the picture, click Focus/Guide, then with the mouse left button, draw a square round the star and click FOCUS. This will invoke a small screen with the star on it, middle picture below, probably well out of focus. I’ve used the Simulator sequence here, but this is the focussing arrangement. Left is the picture just taken of an area of the sky (actually Astroarts simulator picture), with a star and the square drawn round it. Next is the focussing screen invoked by clicking Focus/Guider on the top of the control Panel, then FOCUS. 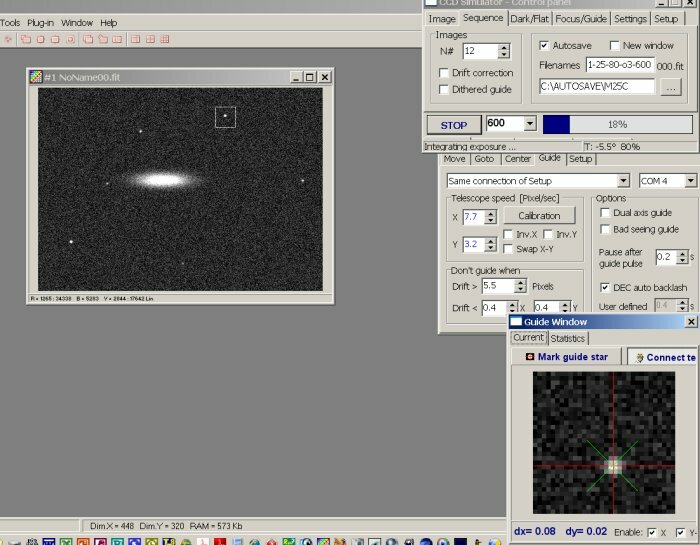 Camera 1 is identified, and this setup means the main camera is taking pictures only of the area squared on the main picture, every 0.5 sec, and showing them on the screen in the middle picture with the numbers calculated for the size of the image in Fwhm (full width, half maximum), of the Standard Deviation Curve. Focus is the number of photon hits the brightest pixel gets. All these numbers change every 0.5 sec. Now you can adjust the telescope’s focuser to focus the star using this screen. 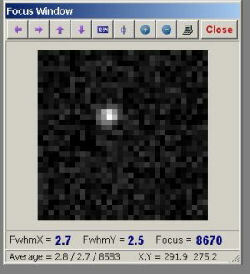 Aim for lowest Fwhm numbers and highest focus number, and look at the picture of the star too, of course. Take your time, this is the most important bit you have to do, the software will do all the rest. You’ll have to let it run a few seconds after each adjustment you make to settle the movement of the telescope after your hand has been on it. The average readings should be judged rather than individual ones, as seeing will affect things, but practice makes perfect. When happy with the result close the panel and take another frame to verify the focus. Then mark the position on your draw tube or wherever you can to save work next time. Send the telescope to your chosen target and go to the Settings tab on the Control panel and change to 4×4 binning. This will make the camera much more sensitive but with less resolution, but you don’t need that for this step, just a speedy means of composing your picture.Take some short frames for this purpose. An Important Point here when ready to take your frames in earnest, is to remember to reset the binning to 1×1 after this, a repeated failure of mine. Take a few more frames to determine exposure at 1×1. 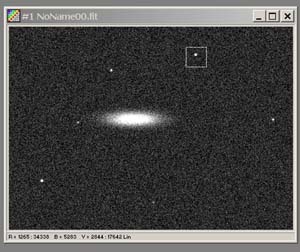 The general basis I work to is long sub frames for nebulae and shorter for bright objects. A mix of both in the same object, like M42 and globulars will need some of both to get the best of it, then lots of fiddling with in Photoshop. Repeat the focusing step to be sure. Focusing is most important, and will change with altitude and temperature, so keep an eye on it. As mentioned before, without a guiding system you’ll have to restrict your exposures to your mount’s capabilities. Even the perfect mount, and there isn’t one, will have limitations and will need guiding for long frames. So, if you have an auto-guiding system, this is what you need to do. Setting up the Guide camera. Fit your guide camera in the guide telescope and connect all the electrical bits and pieces as they should be. If this is your first time, you’ll have to focus the guide camera. Do this as follows. In the Control Panel click Setup then Telescope. The Telescope Control panel will screen. Click the Guide tab. Then I usually move this panel to below the Control Panel, again to keep the screen clear. I set the main parameter there to “Same Connection of Setup” but you may have to try others, and I use Com 4 in the next window, but again you may have to try others before it all works. If this is your first time, the guide camera will not be in focus, and as the chip will be quite small, you’ll have difficulty in finding a star, not just a suitable one. There isn’t a good solution doing this on the run, so it’s far better to have prepared this beforehand. My method is to test the guide camera with a particular eyepiece and get them parfocal then add a parfocal ring to the guide camera, so that when used in anger you focus the telescope by this eyepiece, then exchange the eyepiece for the guide camera and you’re in focus or near enough to see stars on the guide camera’s screen. Back in the Control Panel, click Focus/Guide and choose the second camera, which AA thinks of as the guide, adjust the binning to 2×2 then click GUIDE. The guide camera will take a frame, and throw it onto the laptop screen It may be blank white because the first usually flushes electronic buffers. Take a second and if there isn’t a reasonably bright star in the frame, move the setup, either by adjusting the guide telescope or the main telescope with the direction buttons, till one comes into view, repeatedly taking frames with each reposition, this can be a fiddly business. An aid here is to adjust the exposure time for the guide camera. This is just above and to the left of the Guide button you’ve been clicking on. Default is 0.3 sec, change this to 1.0 sec or more, but not more than 1.5 unless you have a very good mount as it’ll make corrections less frequent. When you can see a star in the guide camera’s window, draw a square around it and click GUIDE again. This click will open the Guide Window panel. Click on Connect Telescope there, and your square with star will appear. You have a chance to tune the focus here, if needed, in the same way as prevously in the Focus window. You don’t have to be as accurate, as the software calculates the centroid of the star for guiding purposes, but it must be well enough focussed so as to have the guide star stand clear of the background or the software will hop from light patch to light patch or from one side of the OOF star to the other with poor guiding results. Sequencing the clicking and drawing squares here is important, and they must be done in the right order, or AA will not understand. With the Guide window open and a single distinct star in it, go to the Telescope Control panel (where the Guide tab was clicked), and click Calibration. The software will check the speed of the telescope drives and enter its advice of settings into the Telescope Speed area of the Telescope Control (Guide) panel. Click the Mark Guide Star button in the Guide Window and Red and Green crosses will centre on the star. The Green is the software’s aim point and the Red marks the star. The software will try to move the telescope to keep the Red cross on the Green one. Watch the guiding for a few minutes, checking for stable control. If not stable, adjust the X and Y speeds and possibly the Inv.X and Inv.Y in the Telescope Speed section. Allow some time here for AA to settle itself as it uses a learning algorithm, and will get better on its own if the parameters are reasonable. Green arrowheads will appear to indicate the direction the software is trying to move the mount to get the crosses lined up. When stable you can return your attention to taking a picture. On the Control Panel, click Sequence, then the number of frames and click Autosave and indicate where you want the programme to file the frames. If you don’t do this well it’ll not know where to put the frames and fold its arms on you without telling you what its upset about. Enter your chosen exposure in the box to the right of START – and you’re ready to take the picture. But first unclick the New Window box or you’ll have the screen full of pictures that clog the system up. All that sounds simple, but you’ll find it isn’t really, there are lots of things that cause problems, but you’ll get better with experience, though if like me, you’ll continue to leave the telescope cover on and wonder why you don’t get see any stars on the frame you take, till it finally dawns on you. But to my mind there isn’t anything to beat the adrenaline rush when a long awaited frame drops onto the laptop screen! You’ll need to be quite disciplined about where you file your work as you’ll soon accumulate thousands of frames. My system is Subject/Camera/Telescope/FR/Filter/exposure ie. M31-25-80-63-900. All the frames I take are then transferred onto my Desktop PC for processing. The directory filing system there is Camera/Object/Date taken, such as M25C/M31/080910.